High Temperature Hose Cables and Wire Protection - JGB Enterprises, Inc.
Protects hoses, cables and wires from molten metal splash, high heat hazards and occasional exposure to flame, in steel plants, glass plants, foundries, cutting and welding shops. Manufactured from high bulk knitted or braided fiberglass sleeving, coated with a custom compounded silicone rubber. Designed to form a protective thermal barrier and extend the life of hydraulic lines, hoses, wires and cables in areas of extreme heat exposure in hazardous environments. Ropes are manufactured using a fiberglass knit braid process that produces a highly flexible, extremely strong and resilient product, ideal for high temperature environments. S/G Tape offers similar protection and benefits as the Pyrotex S/G Fire Sleeving in a wrap form. 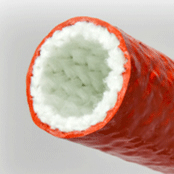 A knitted construction of high bulk fiberglass yarn and coated with a heat resistant silicon rubber compound allows the insulation to be installed on hose, cable and wires while in service. Pyrotex S/G tape is a non-adhesive tape and should be installed in a spiral wrap utilizing a 30% to 50% overlap to insure proper coverage. Tufftex – W is designed to provide abrasion protection for hoses, cables and wires. Manufactured from high tenacity multi-filament Nylon yarn and woven into a flexible tubular sleeving. The construction provides for an easy means to protect, bundle and manage your product in various applications. Manufactured from extruded high density polyethylene, Spiral Guard Wrap will withstand the extremes of climate and operating conditions. The HDPE extrusion process provides a product with round edges which make for easy installation, while protecting against abrasion, cuts, crushing, UV and various hazards which can destroy expensive hose and cable assemblies. Larger sizes are used for both protection and bundling of multiple hose applications. Knitted wire cable hollow and solid core constructions of Stainless Steel, Inconel and Monel for gasket and shielding applications. Knitted wire cable diameters 1/4" thru 11/2” for both soft and resilient sealing requirements. Wire constructions are used as filler for high temperature tadpole gaskets or as a stand alone gasket. 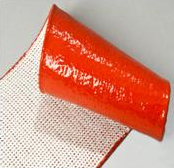 Pyrotex S/G Blankets are high temperature heat resistant fabrics designed to meet the protection requirements for hoses, cables, equipment and machinery in all extreme heat environments. Pyrotex S/G Blankets are water and oil resistant, flame retardant, and easily fabricated. It is available in 17 oz lightweight, 32 oz medium weight and 96 oz heavy weight versions. The high temperature silicone rubber provides a flexible coating resistant to abrasion, tear, and puncture and repels molten splash. Pyrotex S/G blankets are made from woven fiberglass yarns and then coated with a durable high grade silicone rubber compound. They are resistant to most acids, fuels, hydraulic fluids, lubricating oils and solvents. The blankets offer continuous protection up to 260° C / 500° F and with stand molten metal splash and short term temperature spikes to 1200° C / 2200° F.